THIS GIVEAWAY IS CLOSED. THANK YOU TO ALL WHO ENTERED! What a perfect necklace to wear for ♥Valentine's Day♥ or any special day you may have! The Charlotte necklace is named after the last queen of the thirteen American colonies. Queen Charlotte was known to have worn the Hanoverian pearls. The Charlotte necklace in turn, is a modern twist on the old. This necklace is made of faux pearls and gunmetal plating. It’s perfect for bringing a bold look to any outfit. Adjustable - Length 14" to 17"
Amrita Singh has kindly offered one "Charlotte" necklace for a Valentine's Giveaway! Hurry up and enter, because the winner will be picked on FEBRUARY 8th via Random.Org so that the necklace will have time to be shipped before Valentine's Day! Remember...the giveaway ends on February 8th! Like Amrita Singh jewelry on FB. Look up for avatarlady bique. Like FITF on FB. Lopp up for avatarlady bique. I follow Amrita Singh on Twitter as @one_of_three. I follow Fashion in the Forest on Twitter as @one_of_three. I follow with GFC. My username is jcsjcs. 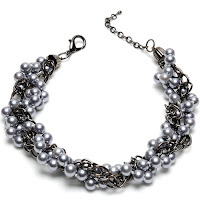 I liked Amrita Singh Jewelry on Facebook(Tami Vollenweider)! I follow FITF publicly via Google Friend Connect (as CatalinaK). I "like" FITF on Facebook (catalina khalaj). I "like" Amrita Singh on Facebook (catalina khalaj). I follow Amrita Singh on Twitter (@CKhalaj).